Merry Christmas Eve everyone! I hope you’re spending your day relaxing with family and friends! Personally, I’m running around the house like a mad woman preparing for our annual Christmas Eve party tonight. I’m still in disbelief that it is already Christmastime! I’m always a little sad when the season ends because I just love all the holiday décor and festive activities! 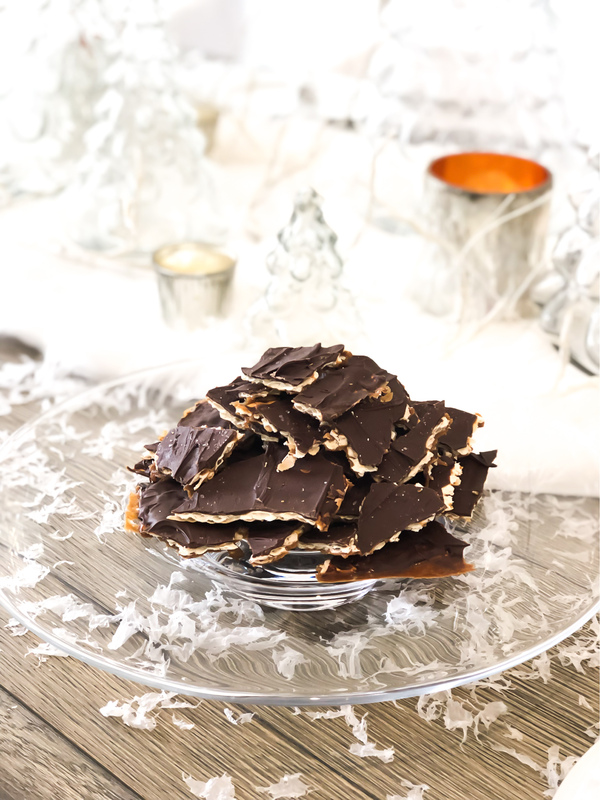 I wanted to take a moment to share the recipe for one of my favorite holiday treats – matzoh bark! I got this recipe from my mother-in-law and it is to die for. It’s so easy to make and is a total crowd pleaser. I mean, who doesn’t love salted caramel and chocolate right? A printable recipe is included at the bottom of the post and my step-by-step process is below! First, line a rimmed baking sheet with foil and ensure the foil completely covers the edges. Cover the foil with parchment paper. Line the pan with unsalted matzoh sheets. You can break them up as needed to fit the space but try to keep your pieces as large as possible. Next, make the caramel sauce. Melt butter in a saucepan and add brown sugar. Stir over low heat until the sugar dissolves. Bring the mixture to a boil and boil for two minutes, stirring constantly. Remove from heat and allow to cool slightly before adding cream and salt. Pour the caramel sauce over your matzohs and work quickly to spread it around using a heat-proof spatula. Bake at 350 degrees for 15 minutes. The caramel will bubble up as it bakes but be sure it does not start to burn. After 15 minutes, remove the pan from the oven and immediately cover the matzohs with chocolate chips. Let the chips soften for 5 minutes, then spread evenly with a spatula. Sprinkle extra sea salt on top if desired. Once cooled, place the pan in the refrigerator for at least 1 hour. After the chocolate has hardened, remove from the refrigerator and break into smaller pieces. Store pieces in refrigerator until ready to serve! I hope you enjoy this recipe, it is one of my absolute favorites this time of year!